My husband and I have been trying to make lighter versions of things lately and have inadvertently been eating vegetarian for the past few weeks. 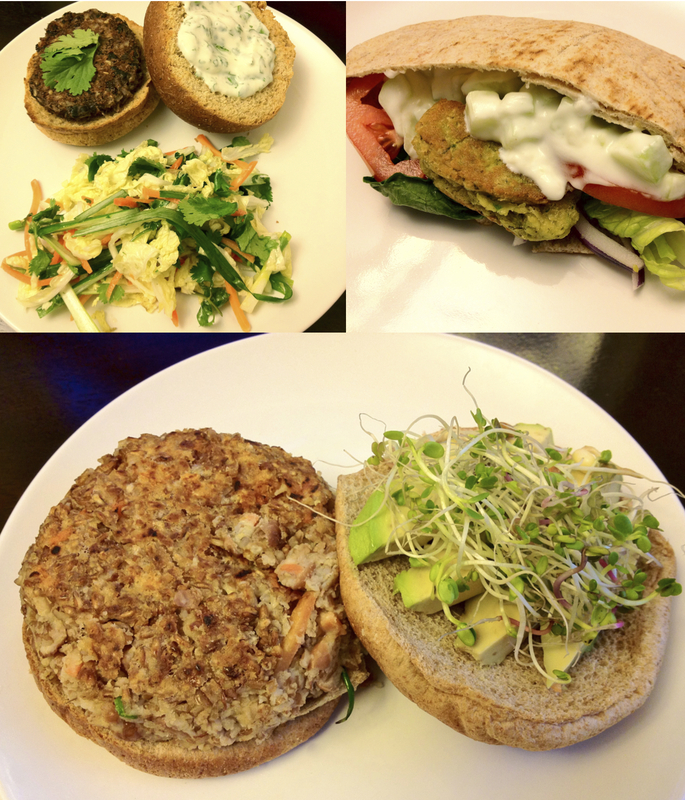 After trying out a bunch of new recipes, I saw a common item popping up in our dinners and that was meatless burgers. Packed full of flavor and incorporating protein in different ways, these 3 different ideas are a great change up to the typical beef patties most of us are accustomed to. This will be a longer post since it will include 3 total recipes, so let’s jump right in! The first “burger” is a black bean and rice cake served with a yogurt sauce and an asian inspired coleslaw, which can be served on the side or directly on the patty. This recipe is vegan if you leave out the yogurt sauce and makes 8 patties, so I usually cook half and freeze half (they will keep in the freezer for 2 weeks). Start by cooking up some brown rice, I follow the instructions on the bag and make 1 serving even though you’ll only need some of it. Preheat your oven to 450 degrees. 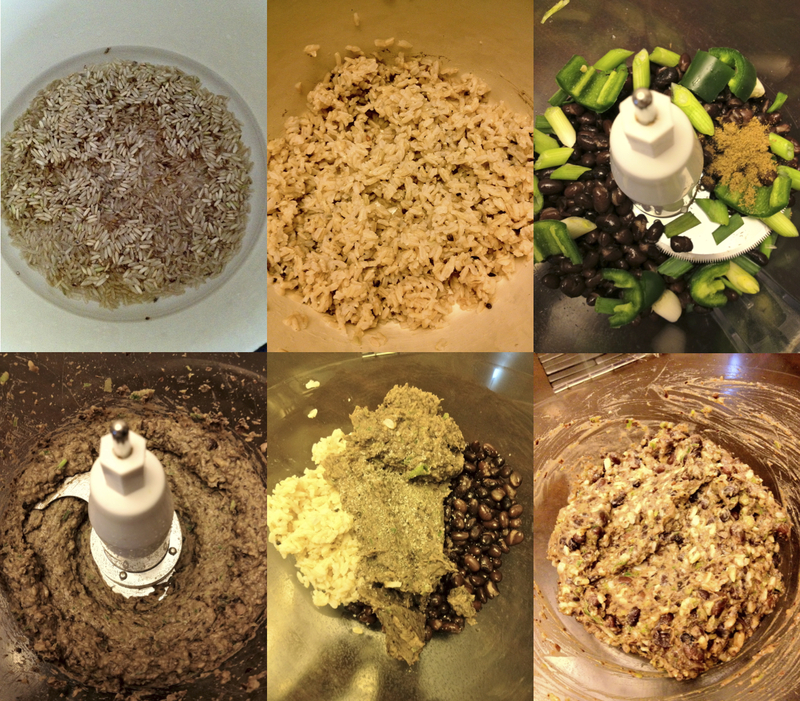 In the bowl of a food processor pulse 1 can (15.5 oz) rinsed and drained black beans, 1 roughly chopped scallion, 1 seeded and chopped jalapeño and 1/2 tsp ground cumin until a chunky paste forms. In a large bowl combine the paste with another can of black beans and 3/4 cup of the cooked brown rice. Season with salt and pepper, and mix until everything is incorporated. 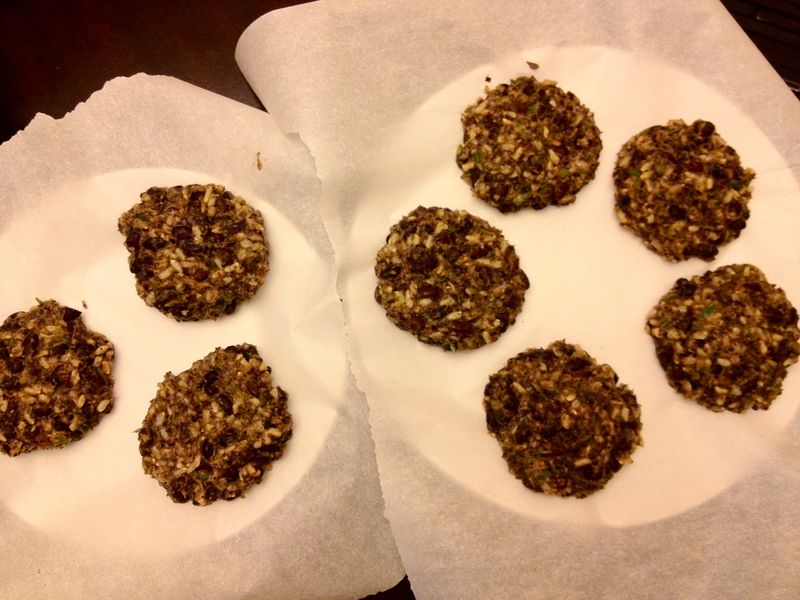 Measure out 8 equal sized patties and place them into parchment lined plates until ready to bake. If you’re going to freeze some of the patties, wrap them individually now and place in the freezer. Brush a baking sheet with 1 tbsp olive oil and put it in the oven to heat up (about 5 minutes). Take the sheet out and carefully place the patties you are going to cook on the sheet. Bake in the oven until the bottoms are golden brown, 10-12 minutes and then let them sit on the sheet out of the oven for a few minutes before removing them. Make the yogurt sauce by combining 1/2 plain nonfat yogurt, 1 tbsp finely chopped cilantro and 1 tbsp fresh lime juice in a small bowl. Start the asian slaw (which is vegan too) by whisking 2 tbsp fresh lime juice, 2 tbsp unseasoned rice vinegar, 1 tsp sesame oil, 2 tsp sugar and a sprinkle of salt in the bottom of a large bowl. 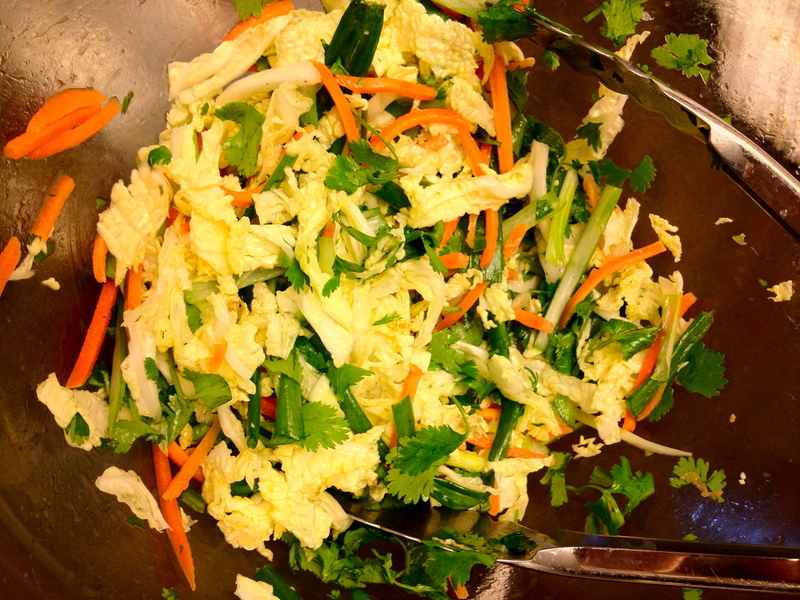 Add in 1/2 of a small head of napa cabbage (shredded), 1 cup of fresh cilantro leaves, 4 scallions cut into matchsticks, 1/2 cup matchstick carrots and 1/2 of a small seeded jalapeño (minced). Toss with the dressing and season to taste. The next “burger” is chickpea based and can be made into patties and served on a bun, but I made them into more of a falafel style. Instead of deep frying them like traditional falalfels, I just pan seared mine and served them in a while wheat pita with a tzatziki inspired cucumber sauce and lots of veggies! 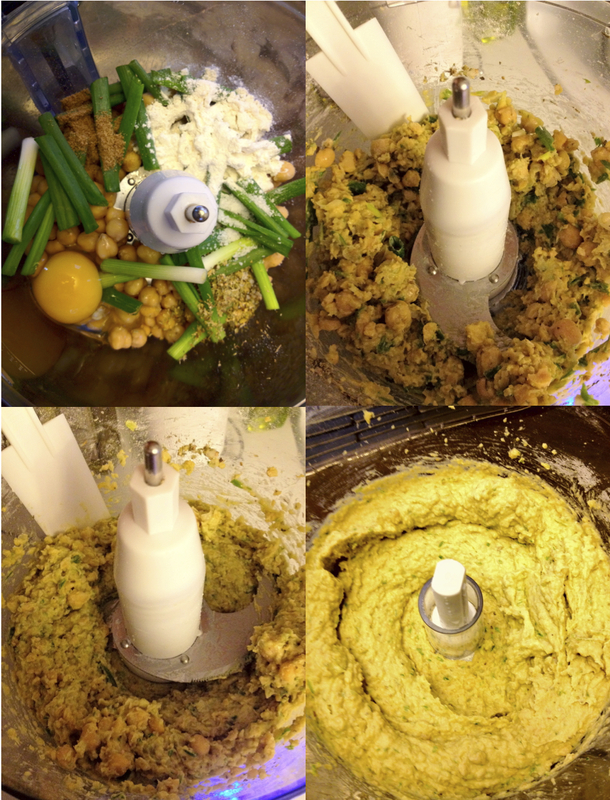 This recipe makes 12 (1 ounce each) falafels. In the bowl of a food processor combine 1 can (15.5 oz) drained and rinsed chickpeas, 4 roughly chopped scallions, 1 egg, 2 tbsp all purpose flour, 1/2 tbsp dried oregano, 1/2 tsp ground cumin and 1/4 tsp salt. Pulse, pausing occasionally to scrape down the sides until a paste forms. Heat up 2 tbsp extra virgin olive oil in a large skillet over medium high heat. Drop in one ounce spoonfuls of the batter and cook until brown on one side, about 4-5 minutes. Carefully flip over using a small offset spatula and cook until the other side is golden brown and crispy, about 3 minutes more. Make the cucumber sauce by combining 1/2 cup nonfat plain yogurt, 1/2 seeded and chopped cucumber, 2 minced cloves of garlic and a pinch of salt. Serve the falafels in a pita (we put 3 falalfels into each large pita) with romaine lettuce, red onion and tomato slices and top with the cucumber sauce. 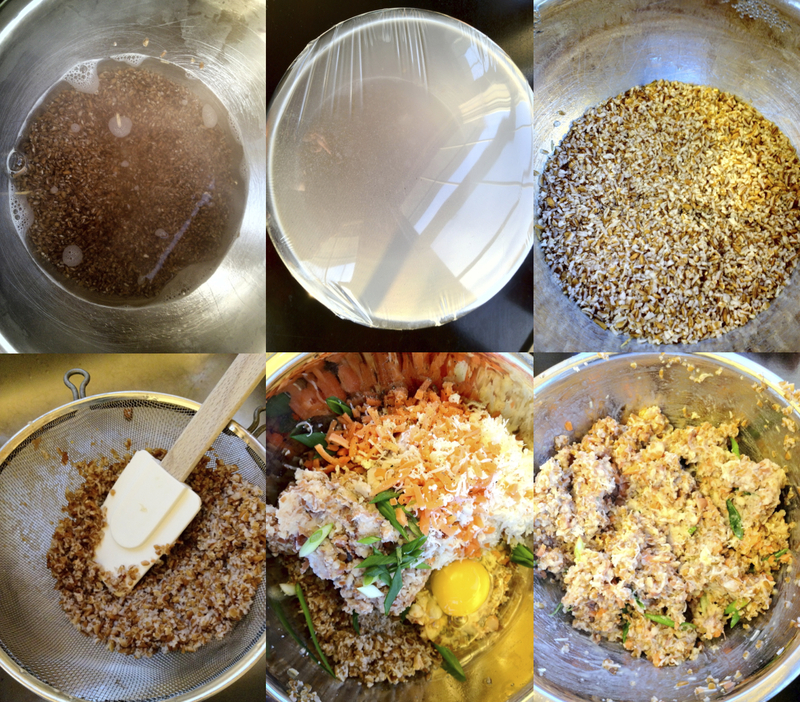 The last “burger” is made from a bulgar wheat base, which might be harder to find then some of the other ingredients. I buy mine in the organic marketplace in our store but it’s also found in the middle eastern aisle in the international section. Red mill makes a great quick-cooking version of it. This recipe makes 6 patties. Place 1/2 cup bulgar into a large bowl and pour in 1 cup boiling water. Cover the bowl immediately with plastic wrap and let sit for 30 minutes. When the plastic wrap is removed, most of the water should be absorbed. Place the bulgar in a fine mesh sieve and push it with a spatula to get out any lingering moisture. Put the bulgar back into the bowl. Pulse 1 can (15.5oz) drained and rinsed pinto beans in a food processor until they form a chunky paste. Add the paste into the bowl with the bulgar and then 1/2 cup grated swiss cheese, 1/2 cup finely chopped or grated carrots, 1 thinly sliced scallion, 1 egg and a pinch of salt and pepper. Mix until everything is incorporated. Measure out 6 equal sized patties. 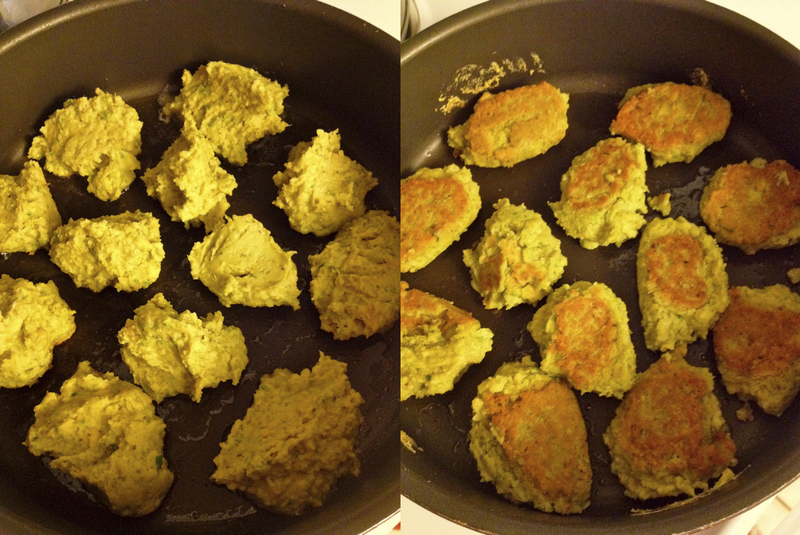 Heat up 1 tbsp of olive oil over medium heat and add patties into skillet. Cook until bottom is brown and crispy, about 3 minutes. Flip the patty and cook until the other side is also brown and crispy, 3 minutes more. Serve on a whole wheat bun with avocado slices and bean sprouts. Beautiful recipes and incredible photos! 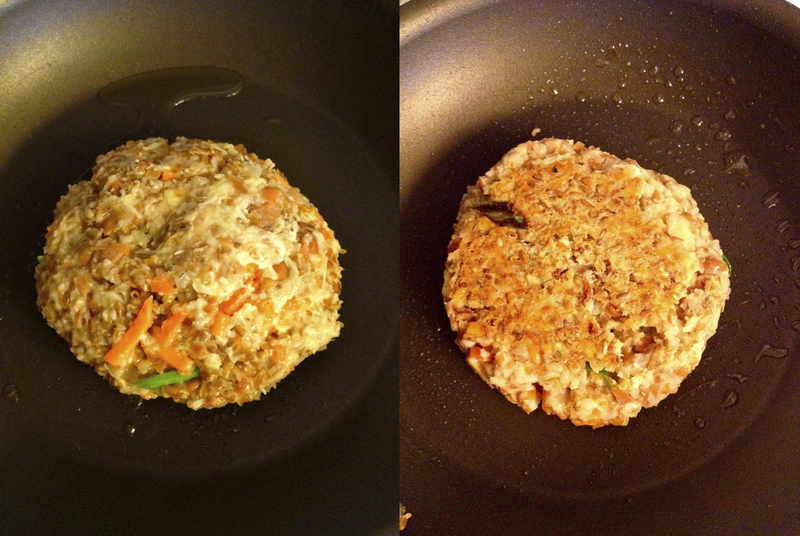 I shall be posting my lentil burger recipe tomorrow :D. I adore veggie burgers, better than meat in my opinion. Thank you very much and I’m looking forward to your lentil burger recipe!! Check out Spiccoli Burgers, Dreena Burton. The BEST vegan burger I have had to date! DELISH! I certainly will… thank you! These are great options for veggie burgers – I’ve made black bean burgers over and over again, so these are some good substitutions! Thanks! I love having some fun alternatives to try and the black bean ones are my favorite!